Lord Barrington starts another campaign when he resumes at Sandown on the Hillside course on Wednesday. The six-year-old is in race seven, the Dream Thoroughbreds Handicap over 1000m with Jack Martin reducing his weight to 55kg. Lord Barrington has not raced since January 7 however, Mike Moroney feels this race is a good starting point for the campaign. “He’s a little bit burly so the trip is ideal for him at this stage,” Moroney said. 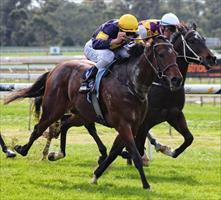 “He’s had two jumpouts leading into this race and both have been very good. Lord Barrington was joint top weight before the claim and Moroney feels is well placed to be competitive. “It does not look the strongest race and from the draw he should get a nice run behind the speed,” Moroney said. “If we did get the forecast rain to put some ease in the track it would help him.